On Tuesday March 20, the San Francisco Board of Supervisors approved a resolution introduced by supervisor Katy Tang, the San Francisco Resolution Against Nuclear War. The resolution was proposed to her by activists from Beyond the Bomb, a grassroots initiative to support public mobilization. We are proud to support Beyond the Bomb in their nationwide grassroots efforts. As Emma Claire Foley of Global Zero says, "Activists across the country are pressing citizens and local lawmakers to engage on nuclear issues, and they have already seen results." We are seeing these results here in San Francisco. San Francisco supervisor Katy Tang's resolution condemns President Trump's rhetorical recklessness around nuclear weapons and voices San Francisco's support for important national legislation restricting President Trump's, and all future presidents', unchecked authority to start a nuclear war. You can read the full resolution here. Ploughshares Fund was proud to stand in solidarity with those promoting the resolution. We were joined by people from Physicians for Social Responsibility, Code Pink, and Beyond the Bomb, as well as unaffiliated activists. Sister Ardith and Sister Carol showed their support, receiving a shout out by Beatrice Fihn, whose International Campaign to Abolish Nuclear Weapons recently won a Nobel Peace Prize. The most exciting component of the resolution, from a policy perspective, is support of S. 200/H.R. 669, the Restricting the First Use of Nuclear Weapons Act, which would prohibit the President's authority to launch nuclear weapons first without without Congressional approval. The bill would not restrict a president's authority to respond to a nuclear attack, but would make us much safer, adding an element of democracy to nuclear weapons policy. This legislation was introduced to the Senate and House by Senator Edward Markey and Congressmember Ted Lieu. Starting with the grassroots can build momentum for change that presently seems impossible. Every community must do what it can to prevent nuclear war, accidental or otherwise, just as every community must stand up for other human rights. Yasmeen Silva (second from right, next to supervisor Katy Tang) was the lead organizer from Beyond the Bomb for this campaign. Dr. Robert Gould, from the San Francisco Bay Area chapter of Physicians for Social Responsibility (PSR) is behind them. He is a former president of Physicians for Social Responsibility, a Nobel Peace Prize winning organization. See the public testimony of Dr. Gould, Yasmeen Silva and others, above. As Joe Cirincione, President of Ploughshares Fund put it, "Congress alone has the power to declare war under the Constitution. Congress must have that authority when it matters most — the decision to start a nuclear war." Through this resolution, San Francisco adds its name to a growing list of cities and organizations demanding a check on the president's absolute authority to start a nuclear war. This resolution adds momentum to another resolution being considered by California state legislators. Assemblymember Cecilia Aguiar-Curry has introduced a joint resolution calling for Congress to rein in the President's nuclear authority, and it's already gaining traction — San Francisco can help get this emergency resolution to Governor Brown's desk. 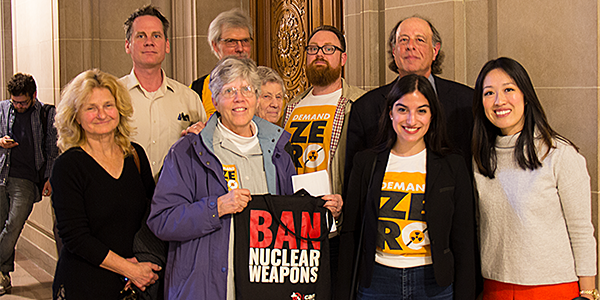 Last year, global security organizations, anti-nuclear weapons advocates, and progressive advocacy organizations presented half a million signatures to members of Congress at a press conference on Capitol Hill, but we're not done yet. Now is the time to speak up locally against any president's unilateral authority to start a nuclear war. Local communities and organizations across the United States have an important role to play in this fight. People Are Speaking Up Locally Against Nuclear War #EliminateNukes #RestrictFirstUse.